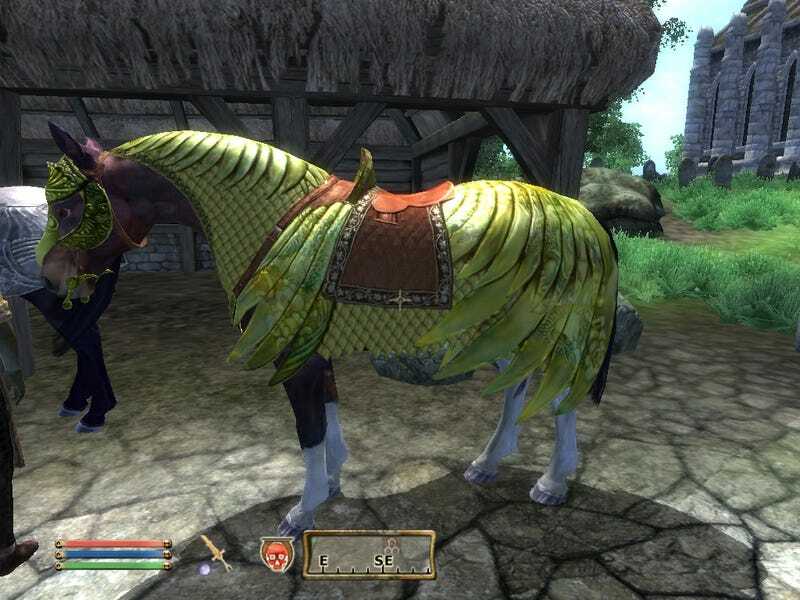 Buying The Elder Scrolls IV: Oblivion's Horse Armor. It's like listening to Barry Manilow, eating at the Olive Garden or ordering Spectravision. No one will admit to doing it, but still enough do so keep it in business. Bethesda Softworks' Pete Hines said, scouts' honor, that this still happens. "I don't have the report in front of me, but multiple people bought horse armour yesterday!" he told Official Xbox Magazine. "For some inexplicable reason. It happened, I promise." Horse Armor, at a price of 200 Microsoft Points, is exactly what its name entails. Armor for your horse in the role playing game. It's an animal costume at a price of $2.50, and one of the first downloadable content extensions released over Xbox Live in 2006. Resentment of this content offering was so fierce Horse Armor quickly attained meme status and became synonymous with insubstantial and/or overpriced DLC. Bethesda weathered it with good humor, offering the content at double the price for April Fool's 2009. Hines used horse armor as an example of Bethesda's posture toward DLC, which considers how long it will take to deliver it to users as much as it does price and content. The rest of his remarks are available in a podcast at the link.